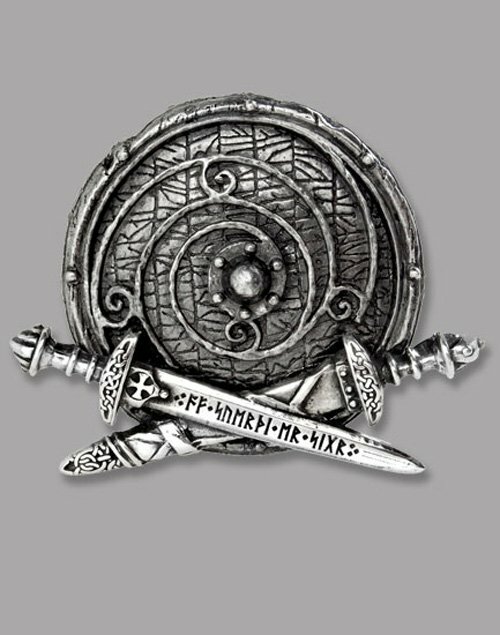 The rune-cut battle shield with traditional Norse spiral-pattern ironwork, is crossed with the trusted swords of a Viking leader; the sword is inscribed 'af sverthi er sigr' - 10th century Skaldic, meaning ""From the Sword comes Victory"", and the shield is incised with a section of Swedish runes from the famous 9th century RÖk Runestone. Fearsome metalwear for the warrior viking. 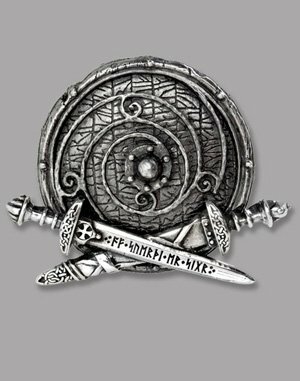 Large, pewter buckle of a Viking war shield with crossed swords. Belt loop and prong on the back for fitting onto standard, 1 1/2-inch belt straps.